Aesthetics are important when it comes to fireplaces. Now you don't have to look at the remote receiver for your Real Fyre gas log burner and wish for it to become more attractive with the Real Fyre Pine Cone Receiver Decorative Cover. 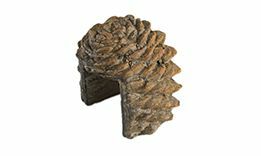 This realistic pine cone design is hand-painted and adds a decorative touch to your existing gas log set. Hide your remote receiver in plain sight with this smart cover from Real Fyre.